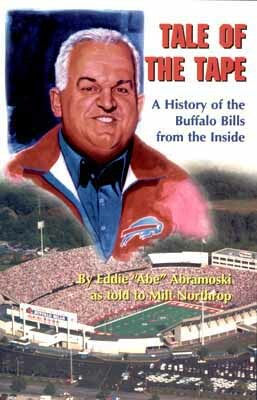 "Abe has a sense of humor and his insightful chronicle of those times, good and bad, takes one on a memorable ride through the inner corridors of the Buffalo Bills, from a perspective that everyone will enjoy."  Ralph C. Wilson Jr.
Leave it to Eddie "Abe" Abramoski, a 35-year veteran of the NFL wars, to capture the emotion, humor and character of the game. "Uncle Abe" joined the team in its first season in 1960, retiring as a legendary trainer in 1995. In this first-of-a-kind book, Abe recounts the team's history, as told to Milt Northrop. Tale of the Tape is filled with revealing anecdotes and dozens of photographs. As Steve Tasker said, "If you really want to know the stories behind the scenes of the Buffalo Bills, this book lets you sit at the feet of the greatest storytelling "Bill" of them all!"